To the millions of kids that grew up playing Super Mario Bros. on their Nintendo console, it was no surprise that the film translation of the game ended up baffling and even disappointing many of them with it’s less-fantastical, more Blade Runner-esque approach. However, in all of the pseudo-polished grittiness the film had to offer, kids like me smiled with joy at some of the subtle game references scattered throughout the prop design and art direction of the film. It was when I saw the movie poster for Super Mario Bros. and the iconic elevator zoom shot in the film’s trailer where Mario & Luigi first don their famed red & green jumpsuits that I realized that the Thwomp Stomper boots were going to be the one iconic prop that truly made Mario & Luigi “super” in the film. I had been fascinated with the design and coolness factor of the Thwomp Stomper boots ever since I first saw the “hero” pair of boots on display at the Disney/MGM Studios in Orlando right as the film was opening in May of 1993. 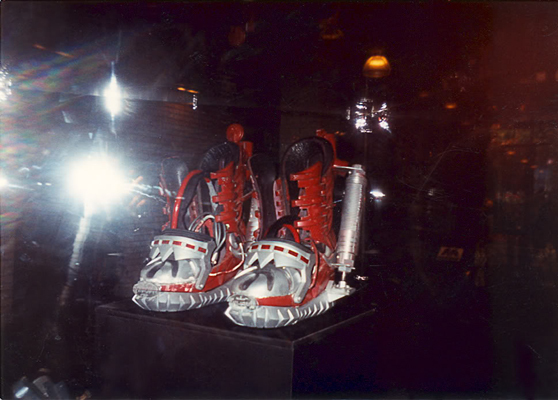 Sure, they were really nothing more than modified ski boots, but their huge metal pneumatic pistons and thick metal soles, coupled with a really sharp color combination of red and silver, made them look like those early 90’s Nickelodeon Moonwalk boots from Hell! And in a kid’s eyes, every inch of them were awesome! That was the day a quest began to find a pair of those boots or any other props from Super Mario Bros. - a quest that would end up taking the next 17 years. Having searched for props from Super Mario Bros. beginning in 2000, a lot of my research determined that although there were many props used in the making of this massive film, unfortunately only a few survived after the production wrapped. Making matters even more disappointing, I found that most of the boots were thrown away and destroyed after production wrapped because the majority of them were made from foam rubber and would deteriorate over time, which made me lose hope that a pair (or even a single boot) would ever turn up. After getting in contact with numerous individuals who worked on the film, they all had great stories about creating the boots and really filled in their backstory, but there was little recollection as to what happened to the surviving boots. However, there was a little hope as a few people did confirm that some pairs survived, one pair even having been dug out of a dumpster outside the cement plant where the Dinohattan set was built. Finally, through a series of contacts within the prop collecting community (whom I am very grateful for), I was told that one lone red Stomper Boot had been found in California – a long ways away from Wilmington, NC where the movie was shot. To little surprise, it was owned by someone who had worked on the film and had had it in storage all these years. In September of 2010, I was finally able to acquire the first Stomper Boot I had seen in 10 years. It was still completely original and had clearly been used as one of the boots that the actors ran in for the iconic elevator scene and around the Koopa Tower corridors. It was worn, weathered, and the foam was cracked in places, but I found it had great character and told us more about the making of the film. There were strips of Velcro inside of the ankle braces and some clothes hangar wire that were clearly used to keep the braces closed around the actors’ ankles. I later confirmed that detail with prop and fungus engineer Mark McCoy, who acknowledged that when the actors were running in the foam boots, the braces tended to pop open, so they found that the Velcro and wire were a quick and easy fix to the problem – an excellent example of the on-set improvisation and ingenuity required by the prop department on a daily basis. 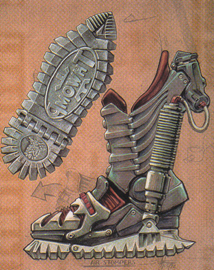 But the true joy of finding one of the Stomper Boots was being able to finally hold one of the boots in person and admire its design from all angles, comparing it to the original concept artwork for the boots, found on this site. It was amazingly close to the concept design and even sported the Thwomp logo and original character from the game on the bottom of the boot’s sole. It was a nod to the game that not a single movie-goer would see in the film, but the prop designers put it there anyways to make the film that much more applicable to the game. It was a testament to the fact that the filmmakers did, in fact, have some respect for the game and try to incorporate elements wherever possible. As irony would have it, while it took me 10 years to finally get a single boot, in August of 2011, an individual in North Carolina stumbled across photos of the first boot I had acquired just a year earlier and was just as shocked as I was to find out that any of these boots had survived. Sure enough, this contact revealed that he had a pair of Stomper Boots that had been in storage for over 10 years and had been purchased from someone who had worked on the film. Surprisingly, he believed that these particular boots (made of foam rubber like the first one) had actually been salvaged after production and were originally trashed…in a dumpster! As fate would have it, he felt he had done his duty over the last decade, taking care of the boots and was looking to place them in a new home where they would be equally admired and just as well-preserved. After all of the decade-long searching, suddenly three boots ended up in my collection! When it rains, it truly does pour. The most recent pair of boots is in even better condition that the first, with much of the foam and original paint left intact. They have also provided an even better look at the Thwomp logo and character on the bottoms of the boot soles, as these are not nearly as heavily worn away. Although these three boots are still the only ones I know to exist, the fact that they were all kept in storage and out of the public eye for so many years after the film wrapped shows that there remains interest in this film even today and that there is a good chance there may still be just a very few boots scattered around the country in private collections. People will say what they want about the quality of the Super Mario Bros. film, but everyone tends to agree that the Thwomp Stomper boots were definitely one of the coolest and most iconic aspects of the film, even to this day! As fans, we are incredibly fortunate that we still have these few pieces of the film’s history left to enjoy, hopefully for many more years to come! Be sure to read Blake's 2018 follow-up for the 25th anniversary in Part Two!